This month I really wanted to focus on what Alexander has been enjoying recently. He has been into numbers, so I wanted to keep some numbers in there. I got him a recorder recently (the musical instrument), and he’s been obsessed with it. So I brought back out his musical instrument set. Finally, he has been into zippers and pouring and other practical life tasks. 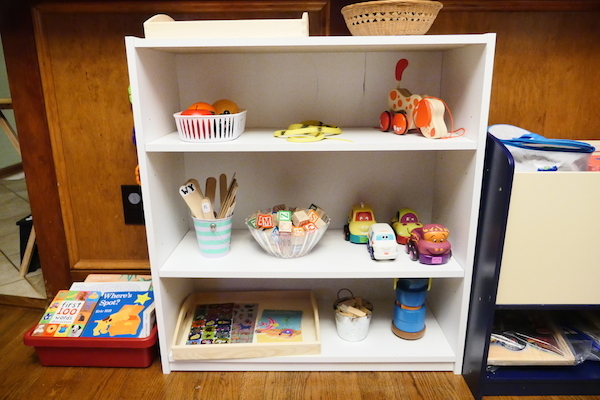 So I made a whole shelf for practical life. Oh, and finally finally, he’s started to climb up on a chair, open the refrigerator, and ask for specific snacks! So I made him a snack shelf in the refrigerator! I’m most nervous about that because it’s not really easy to access each component. It will be a work in progress, for sure. See pictures and more descriptions below! He likes these plastic blocks a lot, so I kept those out for this month. 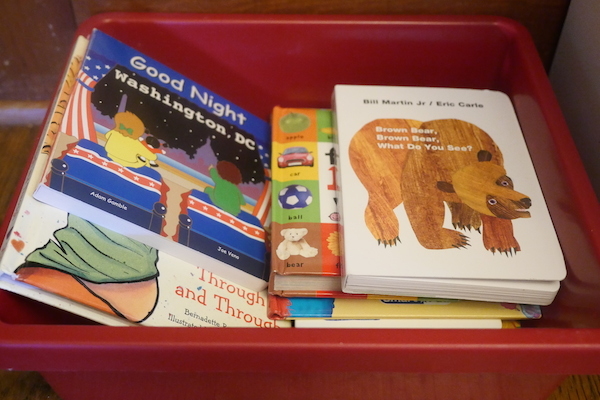 Additionally, I included some books he’s been enjoying, like a Montessori numbers book. This shelf has a few random things, but I’m going to break down each shelf for you. 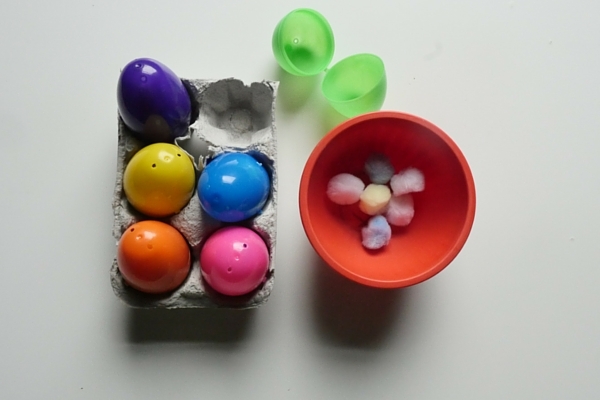 On top, there are some colored sheets of paper and a tiny spray bottle of water. I think he will enjoying using the spray bottle, and I’m hoping that spraying water on paper will create darker spots. And he can see the effect of the water on the paper. Next to the paper and water is a bowl of fake fruit. It’s odd, but he showed some interest in it the other day. I’ll leave it there to see if he does anything with it! 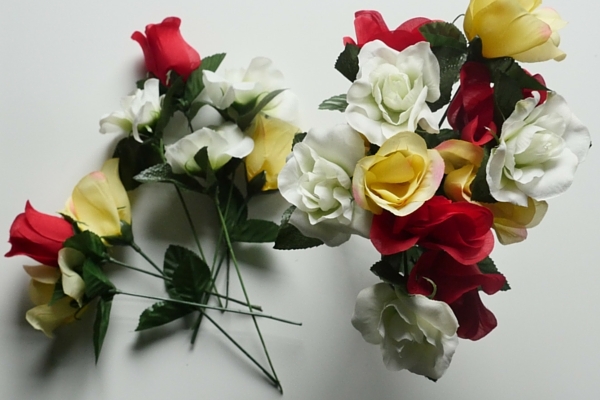 I want to try cutting paper… again. He has tried many times and has never been quite ready. I’m hoping this month is the month when he masters using scissors! Finally, I’ve got a box of colored pencils plus a single white sheet of paper. 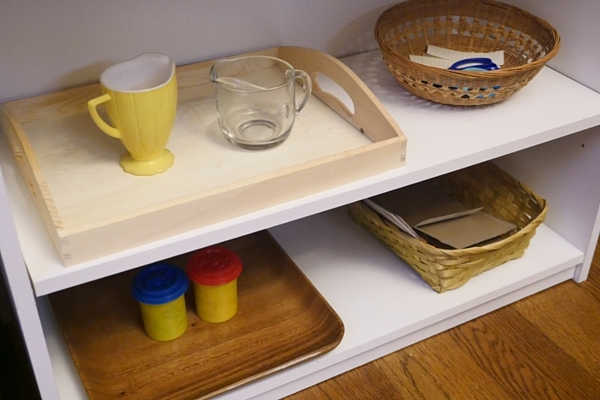 (I may add coloring sheets to the tray.) 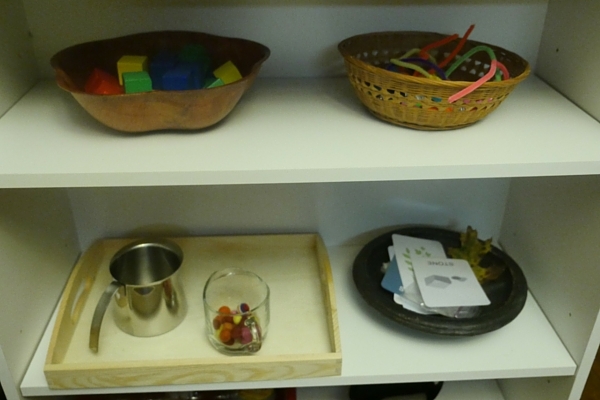 I know Montessori setups are usually open containers, but he has been into opening containers recently. So actually opening the container will be fun for him, I think. 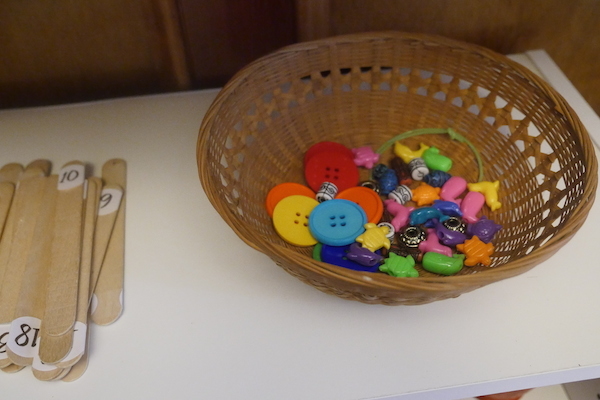 On the left, there’s a bucket of buttons, 5 different colors. The other section of the tray has pipe cleaners that are the same 5 colors. 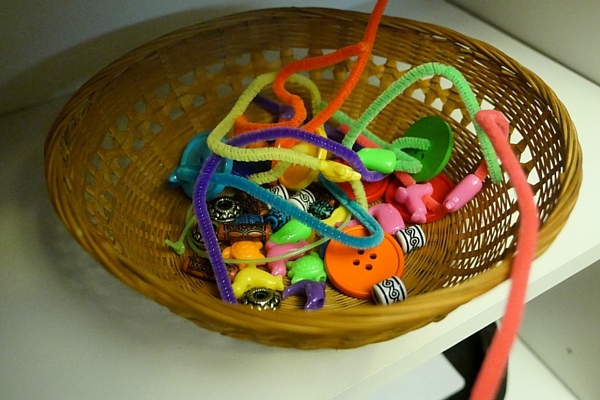 He will likely match the buttons to the pipe cleaners and string them together. In the small box in the middle are two nuts and two bolts. The box is held closed via a magnet, so he will like opening the box as well as twisting the bolts onto the nuts. 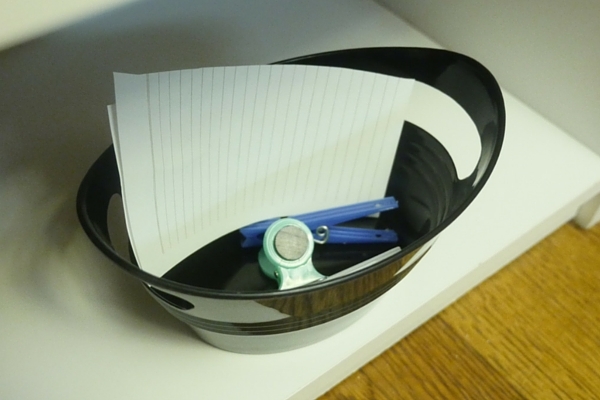 The wooden bowl has tracing cards (numbers 1-10) and a dry erase marker. 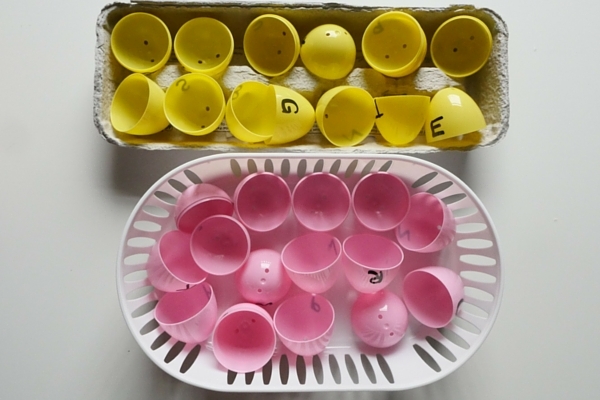 The yellow box at the bottom is shape matching eggs. Again, he’ll like figuring out how to open the box itself. 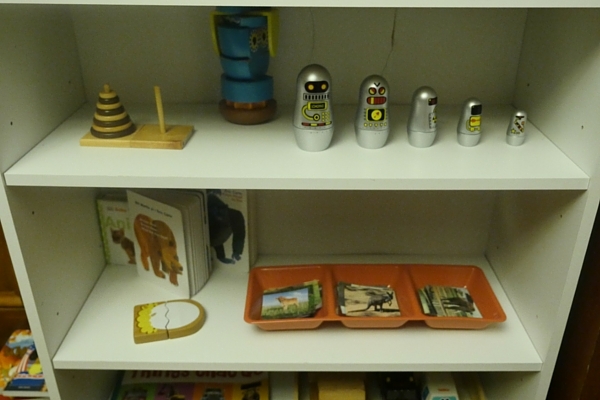 In the middle is a set of nesting dolls that he used to enjoy. I took it away for a month, so I think he’ll like seeing and playing with them again. Finally in the blue bowl, I’ve got some PVC pipe scraps that are 4 different sizes. I’m wondering if he will do anything interesting with those. They may be put away in a week if he doesn’t show any interest in them. (Ignore that cord. I didn’t even notice it! I’ll move it before I go to bed!) The low shelves stayed mostly the same. 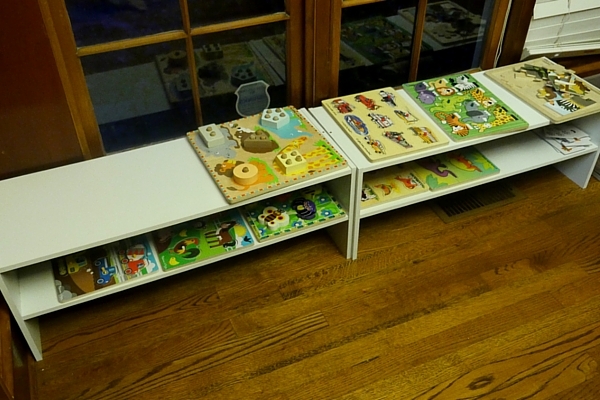 I moved the puzzles to the bottom shelf and the floor. On the top of this, I’ve got a bunch of musical instruments. This is the other low shelf. 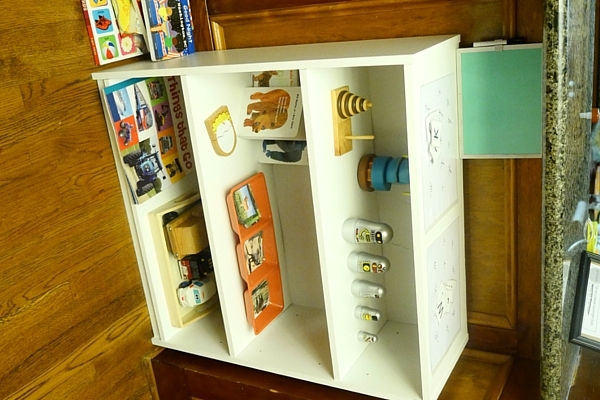 More puzzles are on the bottom shelf and floor. On the top left, it’s a water pouring station. He’s been really into water pouring recently! 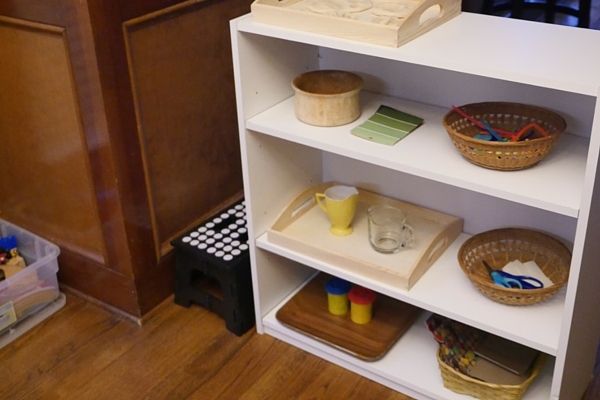 Top right is a PVC pipe + wooden dowel matching activity. I’ve got a blog post coming soon that explains that project. The other shelf is practical life stuff. You’ll see there’s still a small stool on the floor that allows him to turn his light on and off. On top, I’ve got two stuffed animals. On the bear, I have a cloth diaper that uses Velcro to close it. He’s also wearing a bow tie that has a different sort of closure. The rabbit is wearing a cloth diaper that uses snaps to close it. I figured he can practice using Velcro and snaps. He may even figure out how to put on a diaper! That’s a stretch… but wouldn’t that be nice if he could change the new baby’s diaper when he/she comes in January! This is an old wipes box. (That label is not a sticker! I can’t figure out how to remove it!) Anyway, I’ve got some cloth wipes stacked inside. He can open the box in two ways (the button on top and also by opening the whole lid). He can also leave it closed and pull wipes out of the top. I marked two cloth wipes: one of them is marked down the middle horizontally and the other diagonally. I want him to practice folding things in half! 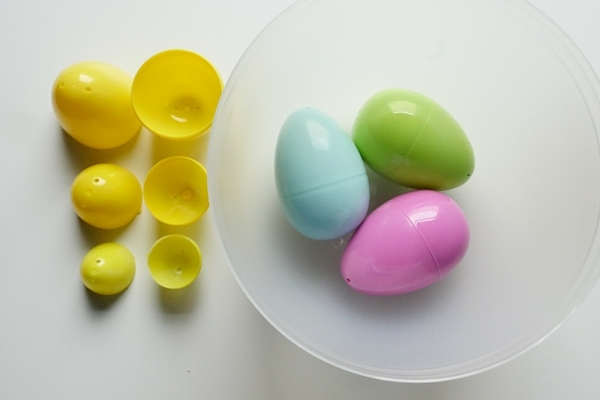 Here are two practical life activities. The left shoe requires pushing the shoe string through the holes. And the sandal has a Velcro closure with a twist. Basically you have to push the strap through a slot, THEN Velcro it closed. This is basic sock matching. There are 4 or 5 pairs (I forgot!) of socks that are different patterns. He will not be able to fold them, I’m sure, but he can match them. These socks are too small for him now, so it’s perfect for matching. Finally it’s the snack station in the refrigerator. There is a paper plate with two halves of bread and a dollop of peanut butter. He can make himself a little sandwich. He has never tried spreading before, so this will be fun for him! In the back there are some blueberries that I already rinsed. There’s a small glass of milk, a banana, and a little bowl of organic animal crackers. I figure, that’s enough snack options for one day. He may not get the concept and want to eat them all at once. If that’s the case, we’ll try again the next day and I’ll just put 2 things in the fridge at a time (so at least he has some sort of snack option). I’m pretty pumped for him to wake up in the morning and see all the new trays and setup! We are busy around here, so the past few weeks have been slow in the school area. Alexander has been practicing letters and numbers, putting together puzzles, and playing with his new animal figurines most days. We’ve been reading more as well. But I was feeling the urge to change things up, especially since I’ve been thinking about the curriculum ideas I’ve had rolling around in my brain. So I moved forward with that, and it made sense that the shelves would change up too. Here’s a tour of our shelves for November! 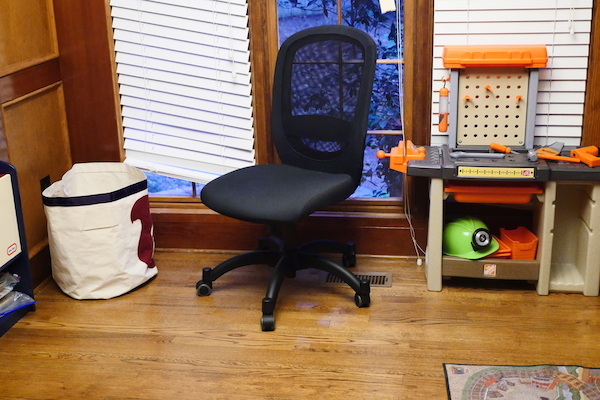 We still have two tall shelves and two short shelves, a bin for train tracks and trains, and a table with two chairs. This shelf is still a few puzzles he likes. The first is just stacking rings (The Tower of Hanoi). 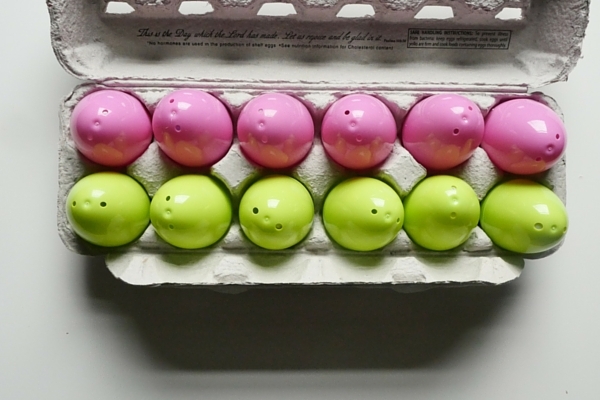 Sometimes he puts them large to small, sometimes dark separate from light, and sometimes it’s seemingly random. 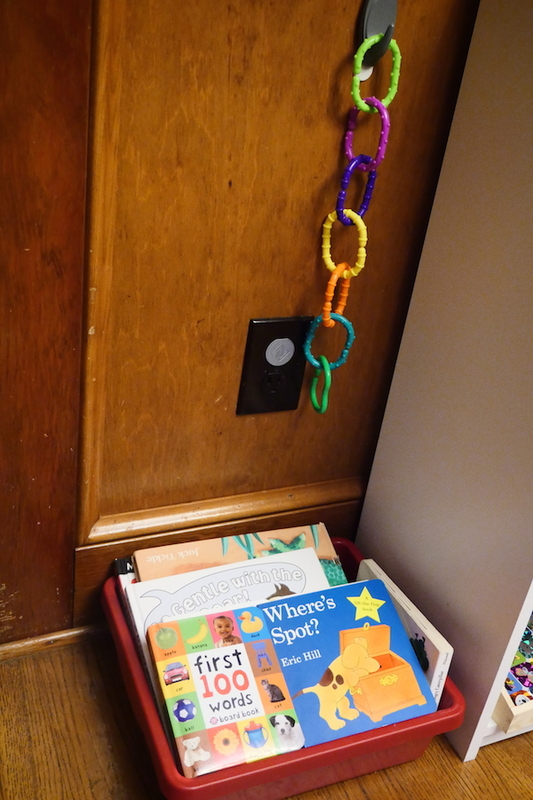 In the middle is the Melissa & Doug owl puzzle that he really likes. And I added a small mirror with a small flashlight that he is able to turn on and off. This shelf is some animal stuff. 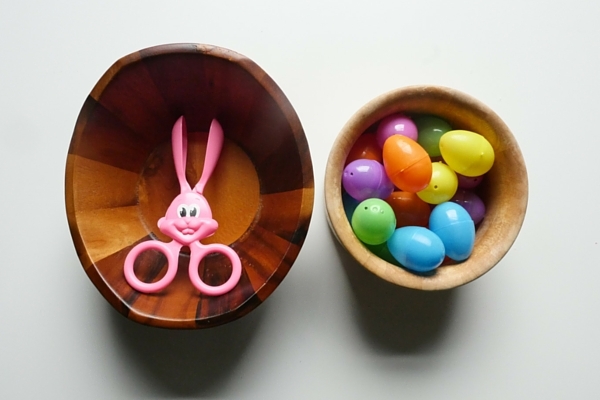 I have his animal figurines in the basket. And in the 3-compartment bin, it’s silhouettes, animal skin/fur, and the animals themselves. Down here, it used to be a few trucks and cars, plus a book about things that go. But he lost interest in that. Now, it is number stuff. 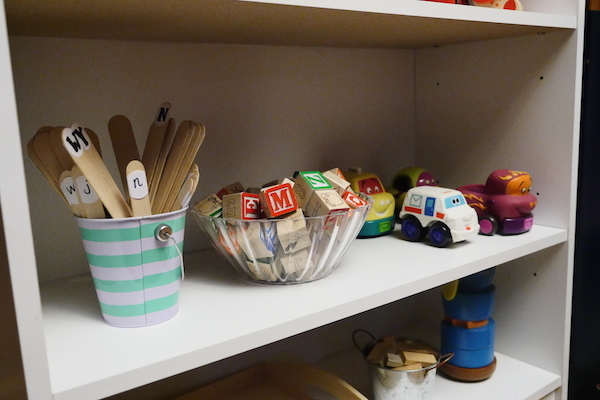 The little jar has 10 lollipop sticks and a dry-erase marker. 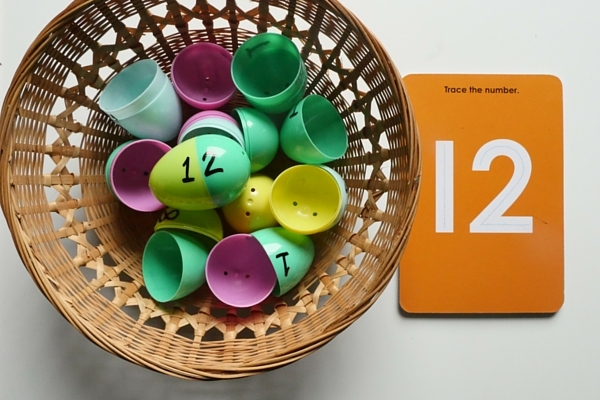 In the middle is a set of wipe-off cards for tracing the numbers 1-10. 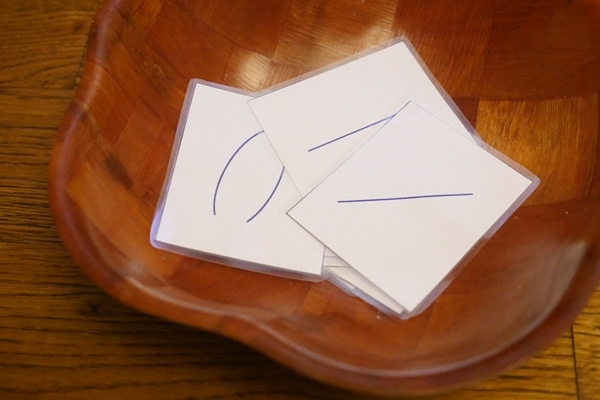 And on the right are some more cards for tracing; they are random lines, some curved, some straight. The lollipop sticks are for quantity. I’m going to see if he can use the cards in the middle and then match up the proper number of sticks to each card. The top of this shelf is more animal stuff. 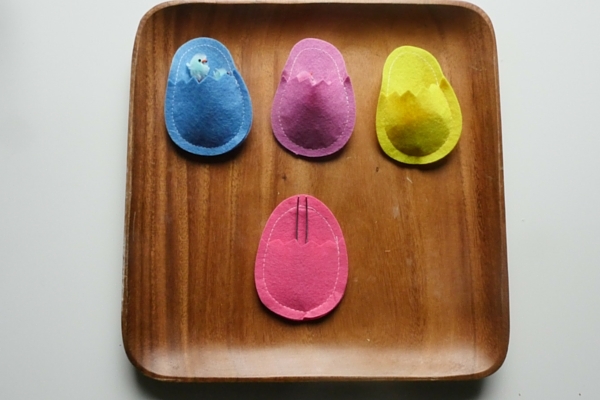 It’s the salt dough animal tracks I made, plus a set of matching cards. 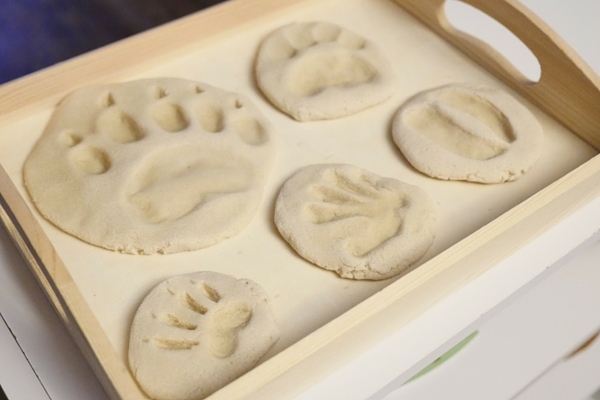 One set is images of animal tracks in real life. The second is images of the actual animals. That blog post is forthcoming. Here, it’s the gradient tiles with matching cards. And it’s also pipe cleaners plus some beads. 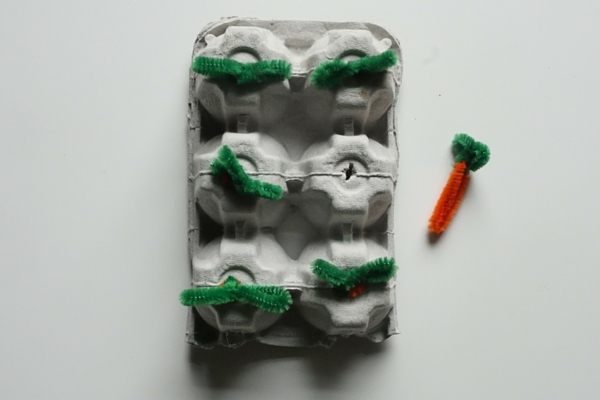 The pipe cleaners work very well for this. Soon we’ll try a regular string again, but for now, this works for him. The pouring station is still there; it’s got two little pouring pitchers and felt balls for the actual pouring. We tried water for a while, but it was a mess every time. Since I can’t always watch and help, I switched to the small balls so he can do that activity without me. Next to the pouring station is cutting! I took away the scissors about a month ago, and I’m bringing them back. We will see how he does with them this time. This is fun stuff. 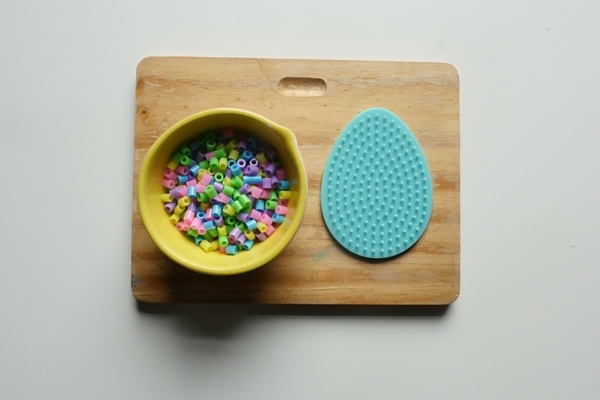 It’s two colors of Play-Doh on the left. And on the right, it’s some pieces of cardboard plus stickers. I’m not sure how those are teaching him anything, but they are at least helping him with fine motor movements. We got a second bookshelf! Yay! It’s the one on the right. And it quickly filled up. Oops. 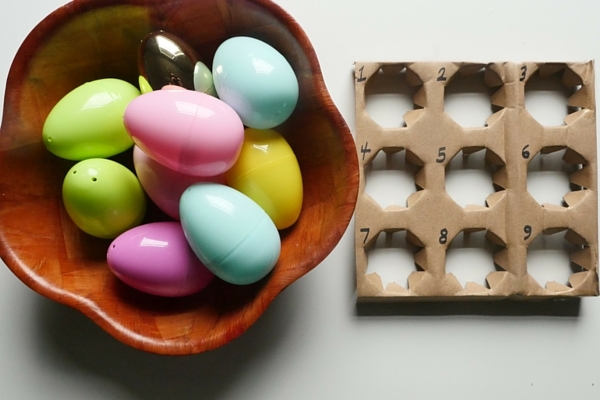 I want to keep things simple, with just 2 items per shelf. I like that he can see outside during the day, but I feel like the broken blinds are a distraction. They are pricey to replace! I should really just invest in some cheap curtains, something that will brighten the “room”. Another note…. I haven’t done it yet, but I really want to hang some pictures next to the left bookshelf. I also have a pile of books on the floor there, which I don’t like! I want to put up a tiny shelf for books. Or get a sweet little basket for the books. Either way, that needs to change soon! Here you can see some of the cursive work we’ve been doing. I hand-wrote A-M and N-Z on two pieces of paper. 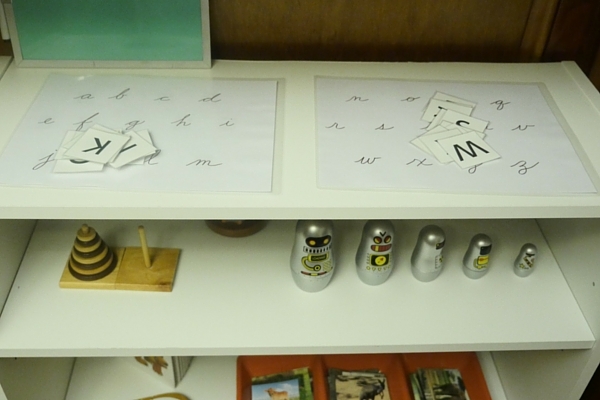 Then I created some uppercase letters for him to match with. He gets A-M 100% of the time now! And N-Z is what we’ll work on this week. The green thing behind some of the letters is a small dry erase board. 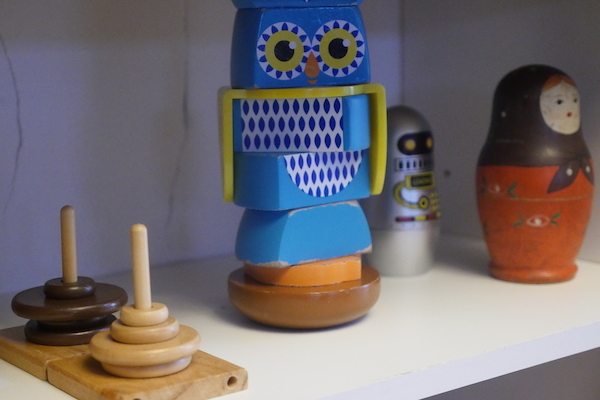 He still loves the Tower of Hanoi (the light/dark rings), the stacking owl puzzle, and the robot nesting dolls. That’s his favorite shelf, if I had to guess! 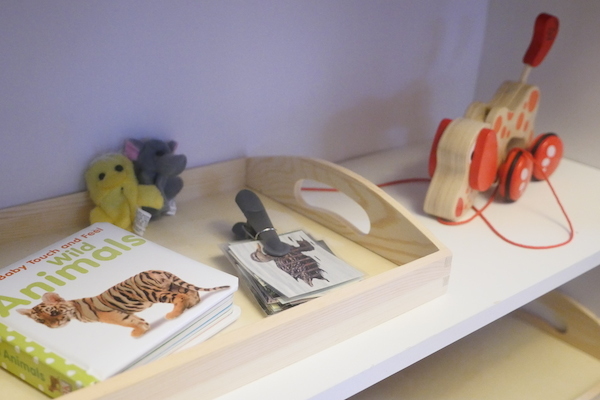 The third shelf is animal stuff: animal matching cards, 3 animal books, and a wooden “toy” that opens and shows a different bird on each side. It’s a bit young for him, honestly, but he likes to open it and say “bird” or “chick”. We’ll leave it there for now! The bottom shelf is still “things that go“! He loves trucks, and we are learning the different types of tricks, like dump trucks and rigs and excavators and more. I don’t think much has changed with the puzzle shelf! 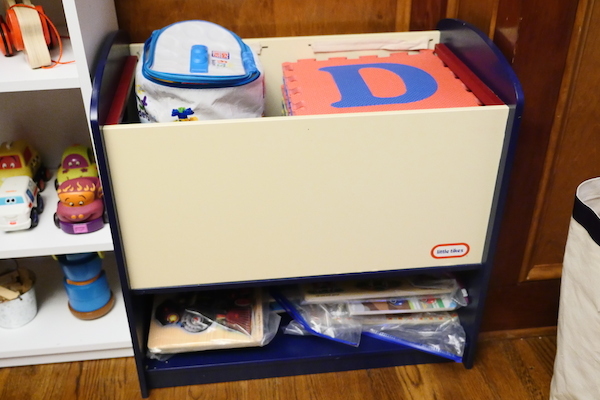 I took away the foam letter blocks that were underneath. It makes it a little simpler on the eyes. 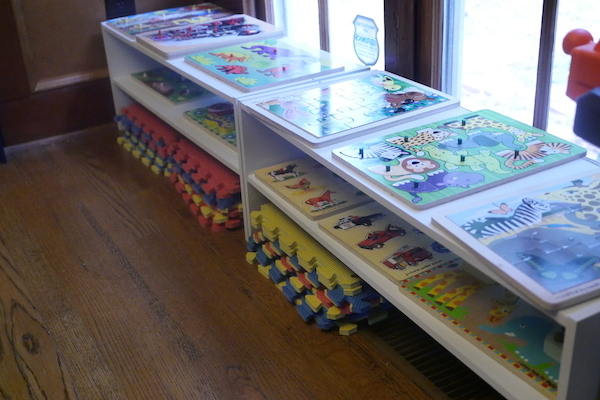 Also, you can’t quite see, but on the far right of the second shelf, there are some matching puzzle cards. They are numbered 1-5 and they match with the quantities 1-5. For example, “2 airplanes” matches up with the number 2 piece. It’s simple, but I want to expose him to quantity as much as possible. I wasn’t sure what to do with the top shelf, honestly. I want to frame a few things and have them displayed since he can’t really reach or see this shelf. 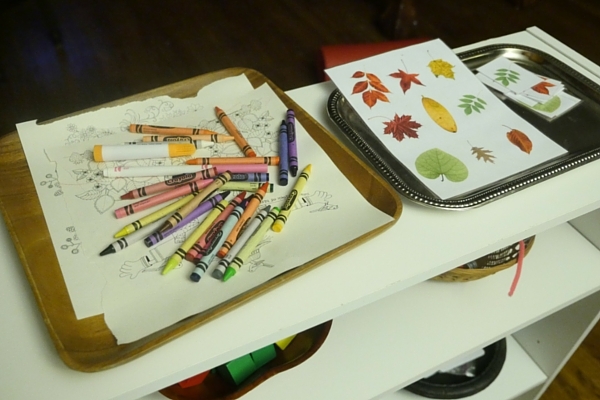 The left is some coloring sheets and colors. 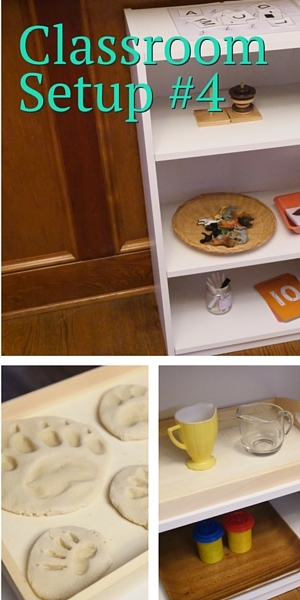 (I love that wooden tray and would like to better use it!) 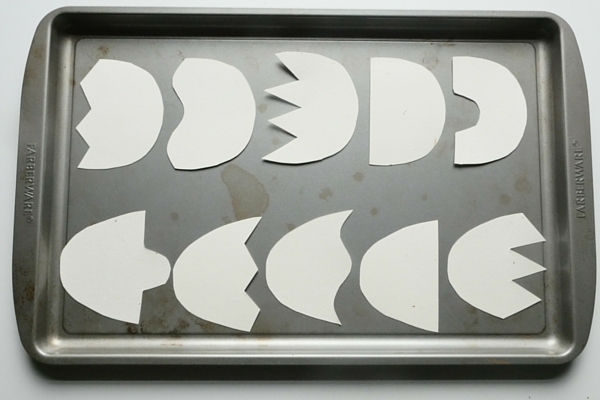 The right tray is the leaf matching game. 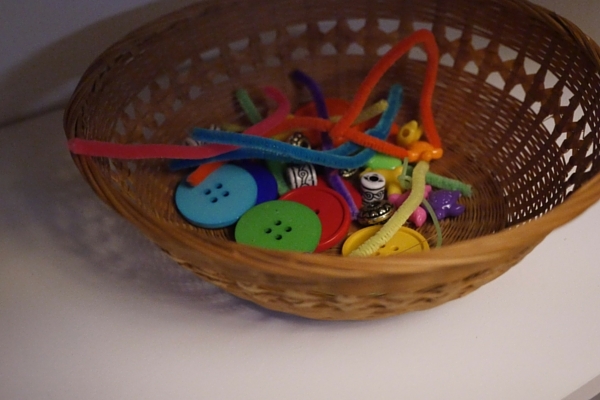 In a little basket, I’ve got some bendable wires, beads, and buttons. Alexander is able to string the wire through the beads much easier than a string. So it’s a good transition for us. He also tends to match the beads/buttons by color to the colored wires. 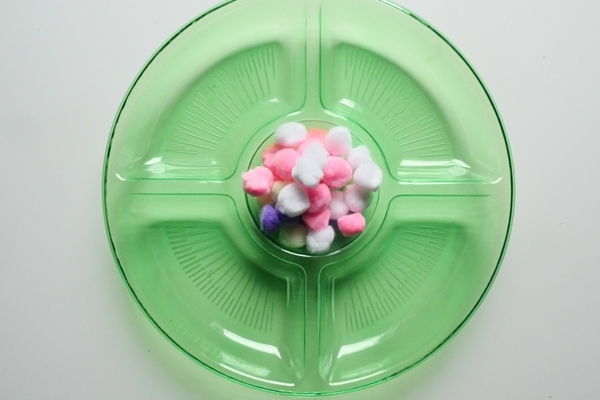 In the left bowl, there are some colored cubes. I don’t know what to do with them just yet. I thought he might stack them, but we can also work with quantity some more and do a “what’s out of place?” game. In other words, I’ll put 5 red blocks and 1 yellow and ask him which one doesn’t belong. I’m not sure if he’s ready for that, but we can try! You can see I’ve added a pouring station. Instead of leaving water out, I have some wool balls. He loves pouring! And this is easier for cleanup. 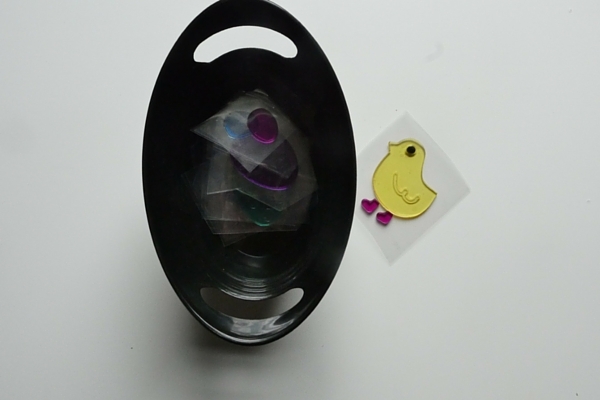 I printed these flashcards from Mr Printables, and I added some 3D objects for him to match. For example, a small yellow ball matches with the SUN card. I don’t like this activity very much, but I can’t figure out how to make it better. 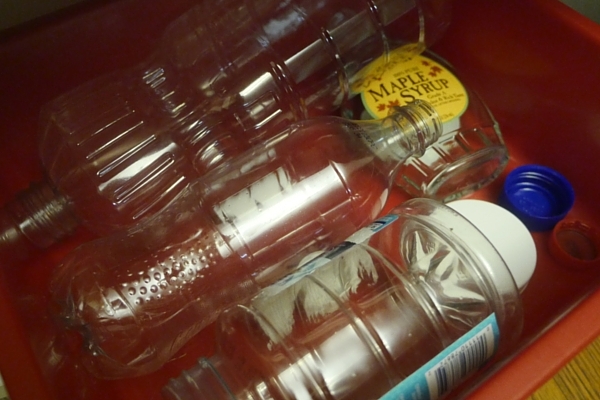 On the bottom left, there’s a bin of empty bottles and their lids. He has to match the lids and also practice screwing the lids onto the bottles. He can match them easily and he can mostly unscrew them. But screwing them on is still a bit of a challenge. Finally it’s a few sheets of paper with a few different clothespins. He may not be strong enough to use the clothespins, but we are working on it! 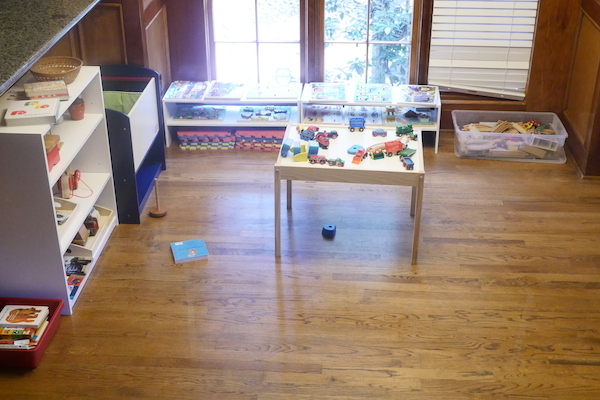 I’m still trying to figure out this whole Montessori thing. This is the 3rd time I’ve arranged the classroom, and I know it will change over and over and over. I’m slowly learning as we go, and it is a blast! 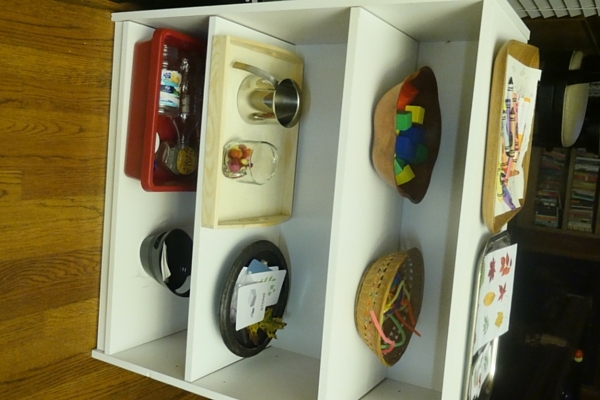 Please check out the other classroom setups to see shelf ideas, activity ideas, and the way our setup has progressed. After some research and feedback in some great Facebook groups, we got a little more shelving and got rid of some of the color. 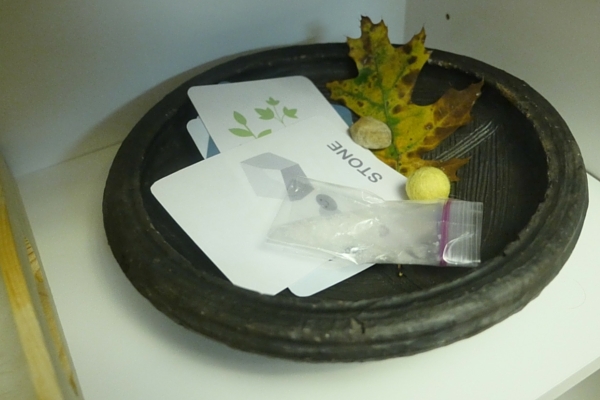 I also took cues from Alexander and moved some of the items that he didn’t find interesting. 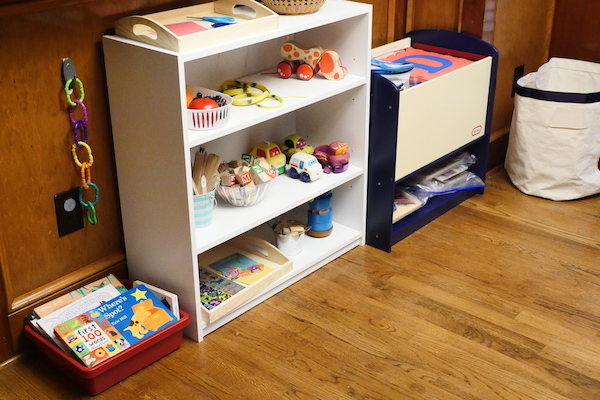 So far, all of the unused materials are stacked in his playroom closet! We’ll get a closet/cabinet of some sort, but that’s down the road. Here’s the whole area now. There are some new shelves under the window. And he has a table. The table came with 2 chairs, but right now, he is more interested in pushing the chairs around instead of sitting in them. We’ll bring them out again in a week or two. The two chairs plus table were $25.00 from IKEA. Not bad! And I like that the shelves and table/chairs are white. That’s something we can keep throughout. 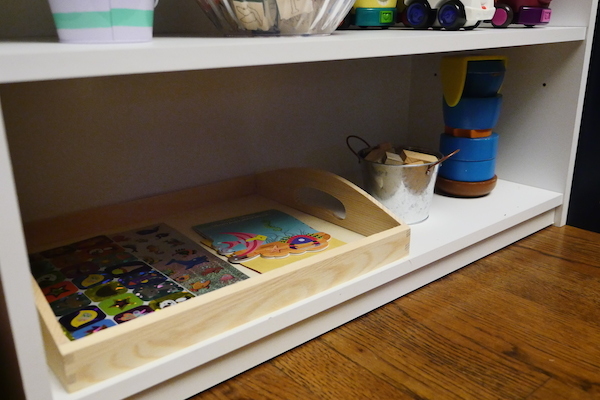 White shelves are easier to find than wood-colored ones. The top shelf. The first two items are all about numbers. I’ve got a few books that deal with numbers or counting. 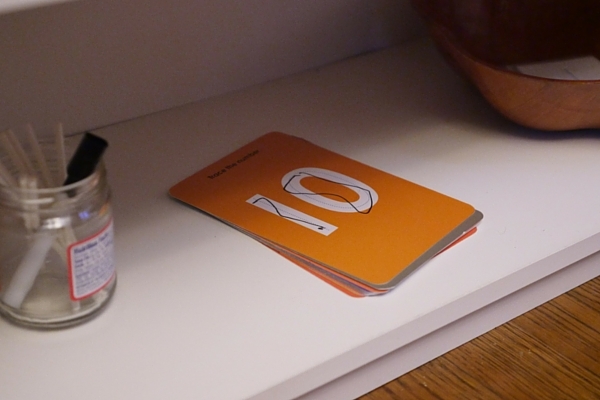 Then there are his number stick “flash cards”. And in the bowl are a selection of beads plus a string for stringing and de-stringing the beads. I need to find a better string for that activity! With this one, most of the beads just slide right off, so it’s hard for him to string them himself. 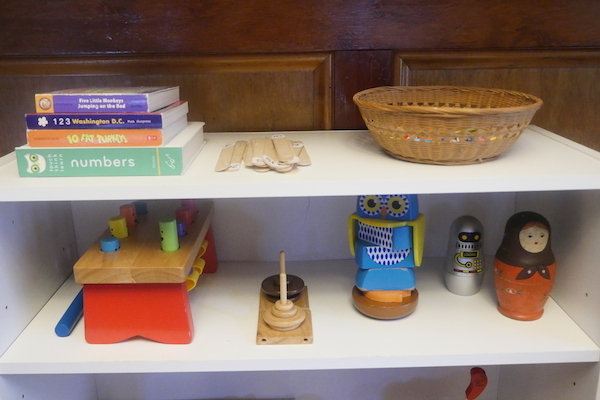 Shelf two has a wooden hammering toy. And then there are some puzzles that he’s really into. I have a Tower of Hanoi puzzle. It’s a logic puzzle, but he just stacks the rings (generally separating them dark from light). The owl puzzle is still there because he likes it. And I have a collection of nesting dolls, so I’ve left two of them for him to explore. So far, he loves them, but he doesn’t nest them. He just puts them together separately. The third shelf is animal stuff. First, it’s a touchy-feely book of wild animals. In the back are two finger puppets (a duck and an elephant). And then there are some animal flash cards that I made and laminated. There are 3 of each animal: a daddy, a mommy, and a baby. Many animals, the mom and dad look the same (to me anyway), but it’s still something fun to match. And finally, it’s the wooden dog pull toy. The bottom shelf is things that go. 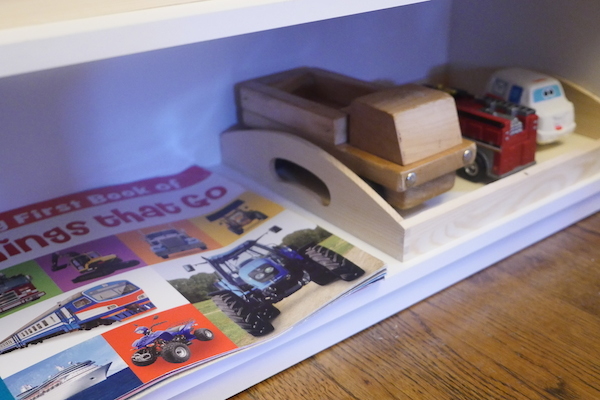 There’s a book filled with trucks and tractors and construction vehicles. 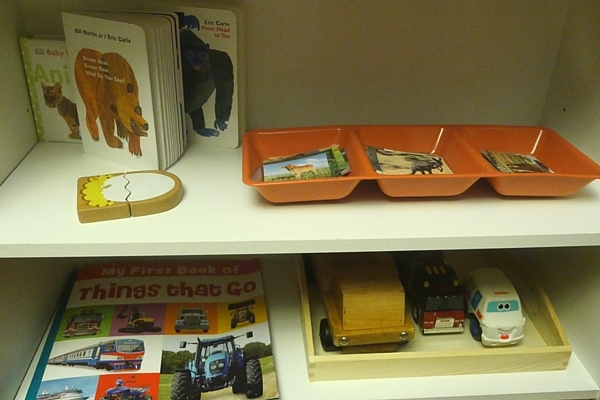 And then there are some actual things that go, like a wooden truck, fire truck, and mail man. The mail man is his favorite! I put them on a tray so they couldn’t roll off. I updated his book box. We read all of the books that were in the box last time, and there were several he just didn’t enjoy. So those are put away for now, and the ones he did enjoy are left here in the box. I also removed the connecting rings from the wall. I cleared out the toy chest, and all that’s left is some colorful building blocks. 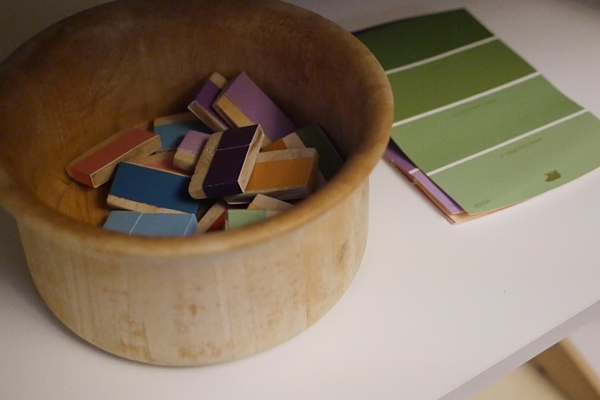 These are painted wood. They’re good for sorting colors and also building. The chest is way too big for them, though, so I’m considering donating the toy chest. Finally, his puzzle area. You can see he has 11 puzzles now. And the foam floor letters are stacked underneath. Funny enough, he hasn’t pulled them out at all, so I may move those upstairs to storage for now. That will also give me more room for puzzles. There are a handful of jigsaw puzzles, and the rest of very simple ones (where a piece fits perfectly into a single slot, you know?). He really prefers the jigsaw style now, so I’d like to start accumulating more of them. 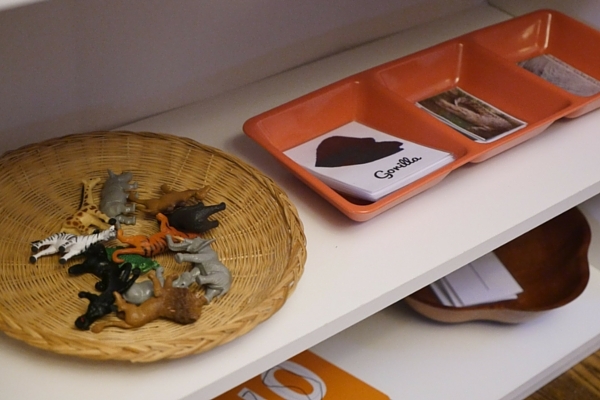 One cool thing that has happened in just a few weeks is that, about 75% of the time, Alexander pulls 1-2 toys off of a shelf, takes them to his table, and then puts them back onto the shelf when he’s done with them. A bit of repetition and modeling, and he’s already starting to clean up after himself! 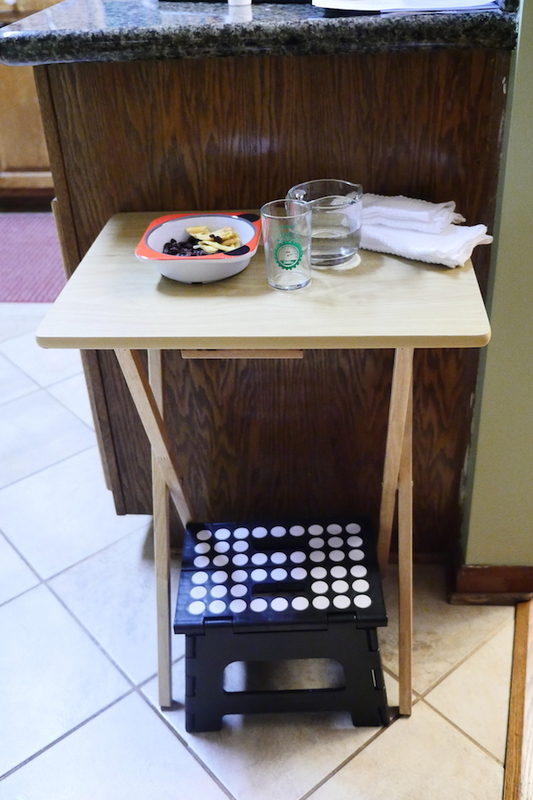 Another thing is a snack station. There’s no place where I can leave a cup of water and a snack for him. I would like to incorporate that somehow, but I need to find a table or surface that’s an appropriate height. 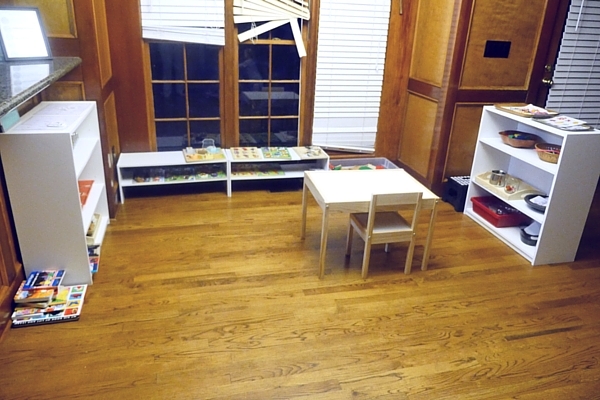 I don’t want to use his little white table because (a) it will get messy and (b) I don’t want him to confuse snack time with learning time. Like, I don’t want him to start thinking that table is for eating. It’s for school stuff, and snack time is a separate thing, in my opinion. 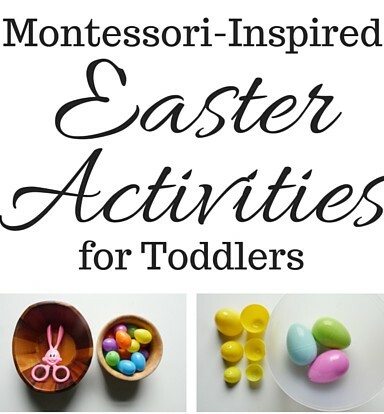 When we first started out with Montessori, I knew I wanted to include hands-on items and activities. I knew I wanted to limit (or omit) things that were electronic. I just didn’t know exactly what to include. This first attempt was a noble effort! Let me give you a tour. The school room (I’ll call it that from now on) is located right outside of the kitchen area. The shelves are positioned under the bar. 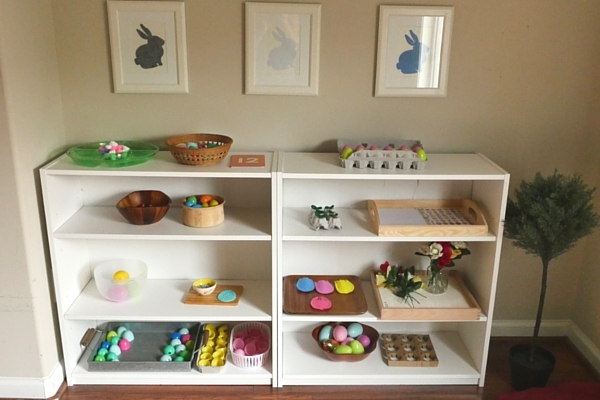 You can see the general setup of our shelves here. At this time, we had just one bookshelf. It was purchased at Wal-Mart for about $15.00. Let me show you what’s on each shelf! 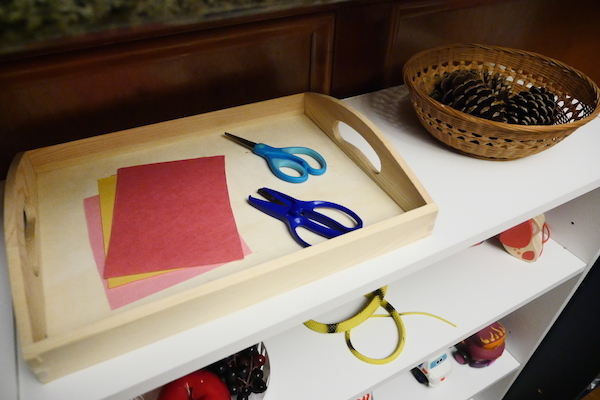 The top shelf has a cutting station with two types of child-friendly scissors. (NOTE Neither pair of scissors was successful at this age.) Also, I had a bowl of pine cones that we collected on a walk one day. They simply sat there. 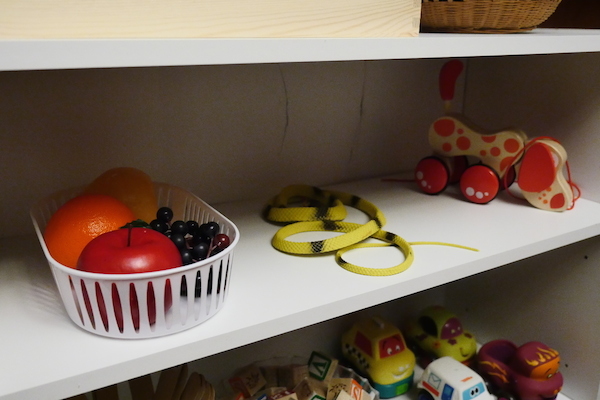 Here, there’s a bowl of plastic fruit, a rubber snake, and a wooden dog pull toy. 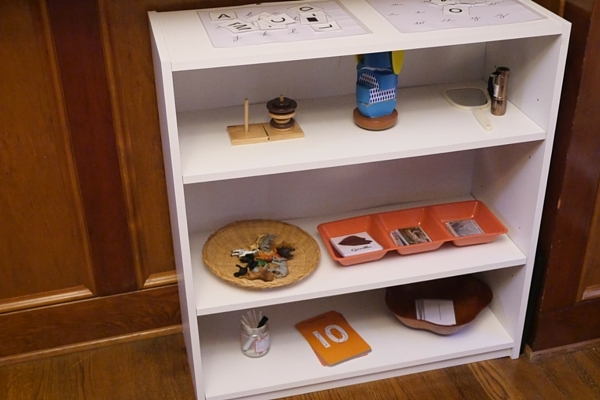 I saw lots of images of Montessori shelves online, and I saw a few of these things. I’m not sure what their purpose is! Alexander wasn’t interested in the fruit or the snake, but he does like pulling the dog. Alexander loves letters. 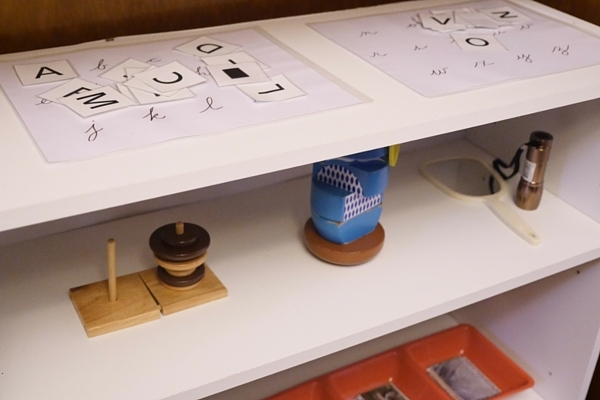 I had made two sets of wooden stick “flash cards”: one set is larger with uppercase letters, and the other set is smaller with lowercase letters. I found out later that it’s best to start with cursive letters! We started with print, but I hope to move onto cursive very soon. Next to the sticks are some wooden blocks that are colorful, have letters and numbers on them, and also have various images (animals and more). And then there are some cars. This shelf is a bit too colorful. It’s overwhelming, and Alexander was only interested in the cars (though normally he loves his letter sticks). 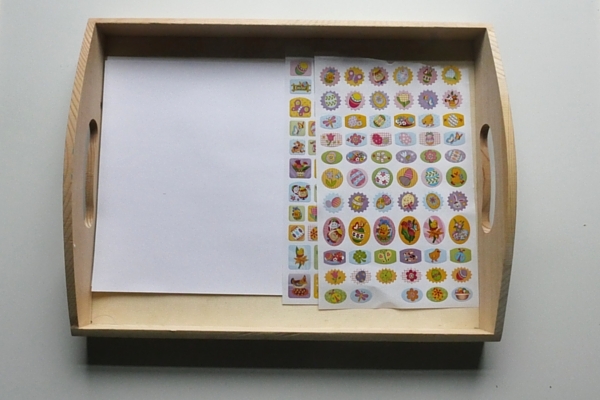 The bottom shelf has a sticker box (sticker sheets plus some plain paper to put them on). Next to the stickers are some building blocks. I found a miniature Jenga set at the Dollar Store. And finally, it’s a stacking puzzle that’s shaped like an owl when completed correctly. 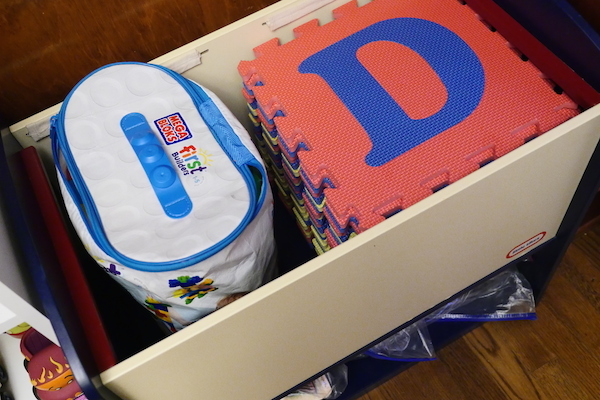 This toy chest is also too busy and too colorful. 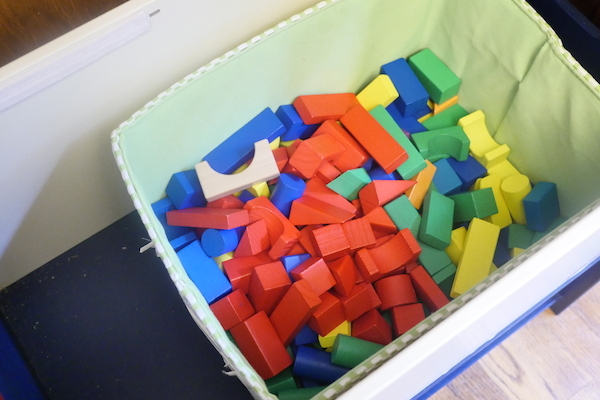 There’s a bag of Mega Bloks that Alexander likes a lot. And then there are some floor letters that form a giant mat. Underneath, there are about 8 puzzles, separated into bags. This cloth bag has musical instruments. Alexander didn’t look into this bag a single time! Here’s a shot of the window area. As you can see there’s a plastic tool station set up. 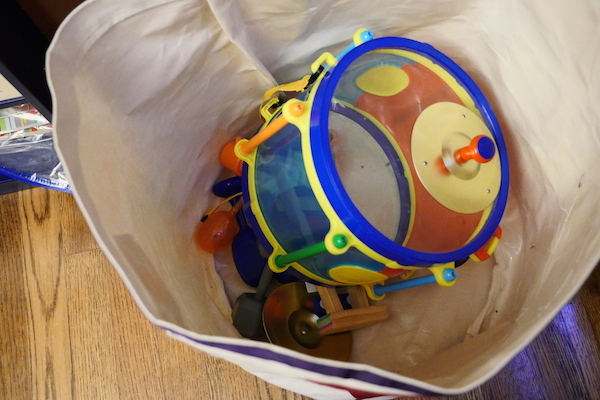 It has since been moved because it was more of a toy, and he didn’t really play with the tools anyway. The chair was there for me because we didn’t know where else to put the chair! 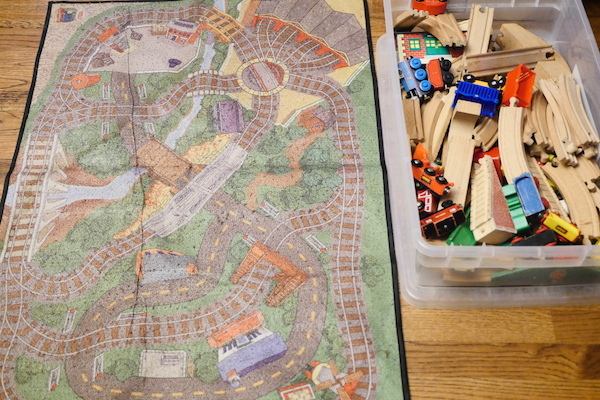 Here is a small rug plus trains and train tracks. Finally, the snack station. 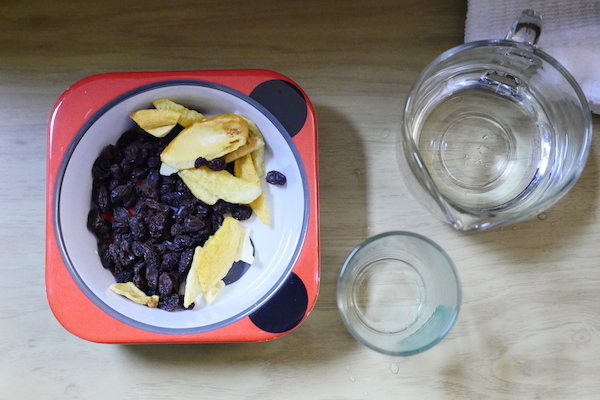 I have a cup and water jug, plus a bowl with dried fruits. We couldn’t find a table of the appropriate height, so we used a step stool. The problem is that Alexander tries to use the table to pull himself up onto the stool. The table nearly fell over several times! 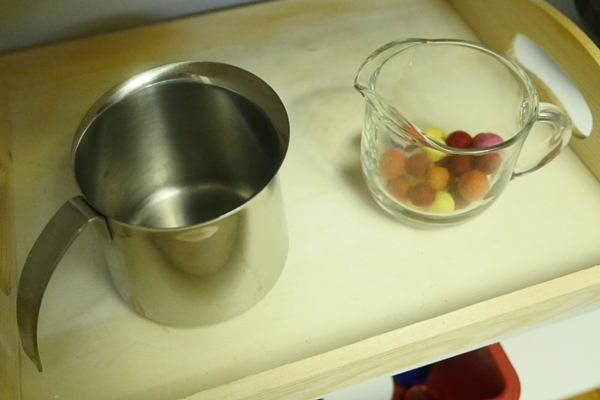 We need a new idea for a snack station! So there is setup #1, and tour #1. Please check out setup #2. You can see a bit more organization and some new shelving.